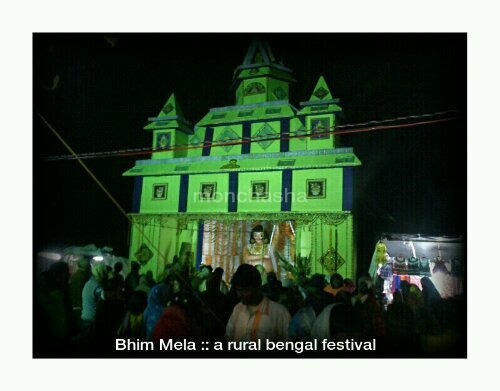 “Bhim Mela” – a popular fair of rural bengal is happening now over at Dakshin Baroj area very near to “mon chasha ecotourism project”. The special event will continue for 9 days from 21st February till 1st of March 2013. 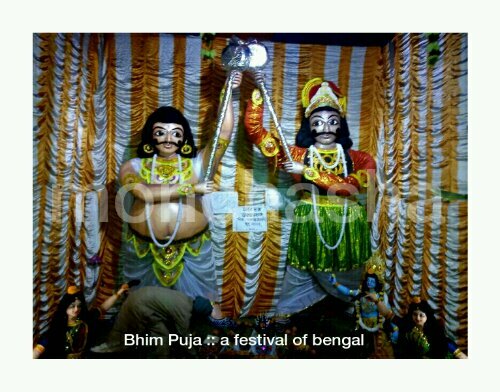 Every year on the Bhim Chaturdashi Tithi – Bengali Month Falgun the festival used to commence with an extraordinary enthusiasm of the local folks of East Midnapore District, West Bengal, India. The management invited us and I have visited the fair on the starting date and enjoyed the opening cetemony with my wife Debjani. 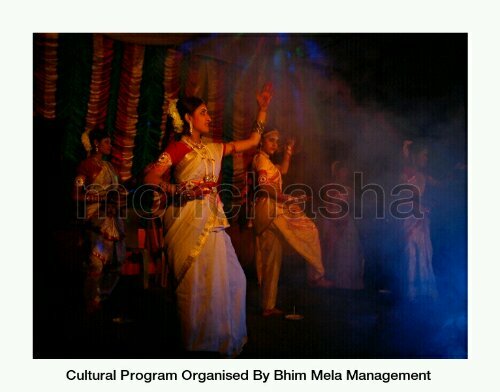 Got to know some imporyant informations about this unknown tradition of rural Bengal. 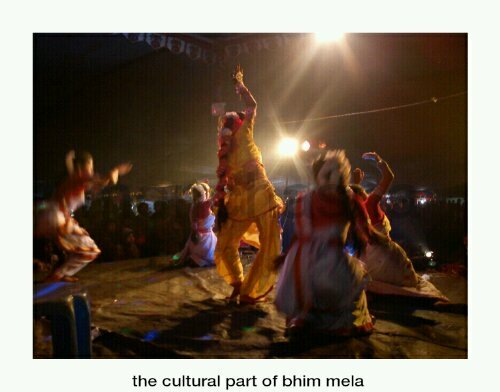 Please go through the pictorial story for some detail of “Bhim Mela”. According to the epic “Mahabharata” – “Bhim” used to be the most strongest person and one of the brother of reknowned “Pandav’s”, who won the war with “Duryodhan” – the most important person of the 100 brother and one sister “Kaurav Family”. At the end Bhim killed Durjodhan. The village people celebrate this auspicious event as a festival now from their core of heart. They think that their beloved “Bhim” will save them from all the evils and enemies and they used to attend this fair to offer a “puja”. Now-a-days this simple “puja” turned to an eventful festival for the entertainment lovers of East Midnapore villagers. Lot of this type models decorate the event arena which can be an added attraction for the fair visitors. Each model symbolises the facts of “Mahabharata” and also some contemporary issues of modern life. 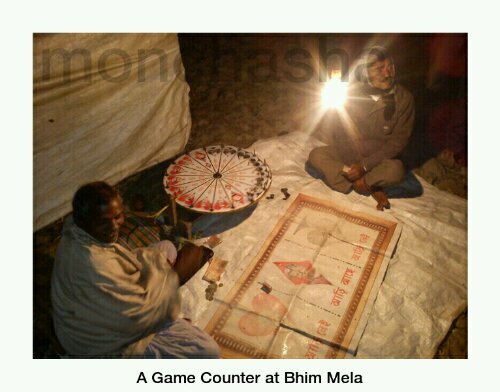 Soft gamble related to Playing Cards, Number games add colour to the said “Bhim Mela”. 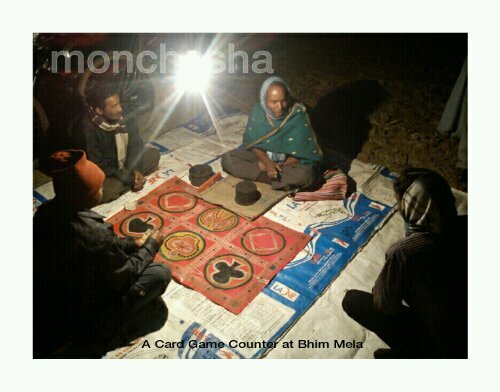 This games are very much popular to the local people. Over at Bengal, festivals are one of the major entertainment tool for the farmers, fishermen, potters, shop owners, suppliers and the daily waged labour groups. Not only them but also to the housewifes these fairs are the most important event after their daily life schedule. So still now “Jatra Pala”, “Kobir Lorai”, “Kathokata”, “Kirton – Sonkirton”, “Mela”, “Parbon”, “Sonkranti” plays important role to supply direct oxygen to the local hard lifers of rural bengal. You can also enjoy the cultural programs performed by local villagers and their guests coming from outside. The festival management arange different “Jatrapala” based on both ancient and modern topics with traditional cultural events, games in this continue 9 day fair. With the “Puja Rituals” you can also experience the “Bom Gaach” – a bomb tree, which is fired as an offering to “Bhim God”. In this corner of rural Bengal this is one of the important factor of all puja festivals where “Manasik”s are done with these amazing bomb tree offerings. In Bengal “Mela” (Fair) means “Milan” (Social Attachment) which cannot be completed without “Paapar Bhaja” (Fried Papad) and “Hot Jilipi”, “Kotkoti” – types of sweet item. So according to the demand local villegers operate small stalls with the support of mela comitee and sell their items. You can have a look over to these Food – Costume Jewellery – Cooking Utensils – Sports Items and also vegetables, fish shops in this festival arena. 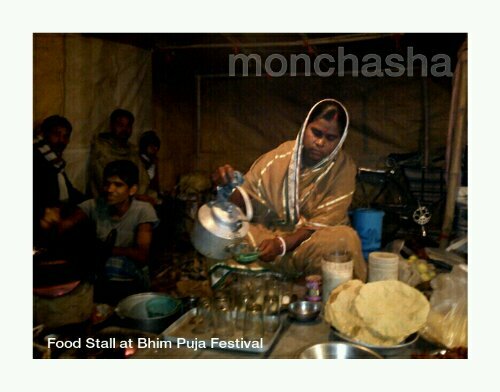 guests of “mon chasha” enjoyed the fair a lot – also suggested some new ideas to the fair comitee for the betterment and future planning of “Bhim Mela”. 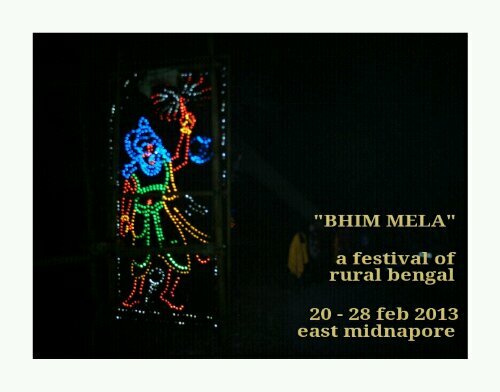 Please visit this event and you can experience the hidden treasures of bengal villages. Through these fairs you can feel the rustic but romantic village life of Bengal. Behalf of “mon chasha ecotourism project”, we have already supported this wonderful event in every aspect. In future also we will spread our hands to them. To “mon chasha” – Bengal is Beautiful, Bengal is Simple, Bengal is Live here. – Still Life in Bengal. See you there. mon chasha. These are promising handicraft artists of Village Paushi, East Midnapore. We are supporting them directly. Please be with us. Support Ecotourism. Thanks.